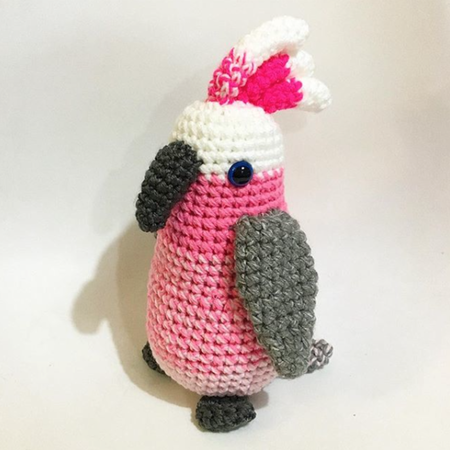 Lovingly handmade, this amigurumi-style crocheted galah has a mainly pink body, plastic safety eyes hand stitched finishes. He is approx 28cm tall. But the size may vary slightly as they are each handmade by us. If we have the item in stock, delivery will be in 3-5 days, however, if we need to make the item, please allow 2-3 weeks to receive it. We will clarify this with you upon receipt of your order. We can ship to any country, please just ask and we will let you know the postage costs. We use environmentally friendly recycled PET stuffing. The fibre is 100% non-allergenic, and for every 1kg of fibre used, we save around 70 water bottles from ending up in landfill! Yay! Our toys are machine washable (just pop it in a garment bag to keep it safe in the machine) and dry in the sun. It may need to be 'moulded' back into shape after washing.